Emails announcing the news that Sir CP Shriwastava, Shri Mataji's husband, has been honored with the second highest civilian honor in India, the Padma Vibhushan. This blog took a minute to introspect to put the news into perspective. 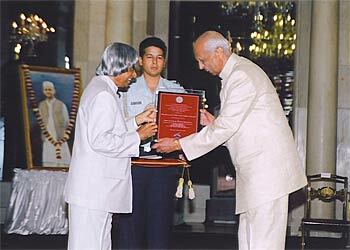 Sir CP has been a silent and benevolent aide to the work of Sahaja Yoga. Firstly through the sacrifice of personal time in the 70s which would only increase. But personal time is not the only thing that Sir Chandrika Prasad put into the nascent years of Sahaja. Sir CP gave money generously for the rehabilitation of damaged seekers, often reminiscing the day he came home to find a homeless British gentleman dressed in Indian clothes from his own wardrobe, sipping tea. In the early 90s, while talking to yogis in Australia, Shri Mataji presented Sir CP as an example of blemishless service to the nation and lessons in monetory honesty that can be learnt from him. I recall an experience that a fellow yuva had with him in 2001 at their home in Pune. There was a sudden infestation of snakes in the house at the time and someone had just spotted one climbing the leg of a sofa. On the sofa they sat, aware, dignified and composed. Both of them witnessing another snake being captured, inches from them with the temperament of watching a silly drama unfold. Sir CP is the distinguished author of the book "Corruption" which I have not read, and will refrain from commenting. But I do know, being an Indian myself, that it takes a lot of courage, poise and strength to survive as an honest civil servant in the corrupted Indian beauraucracy. Not only he demonstrates survival in a hostile environment through idealism, but inspires young Indians like me to have hope in honesty and idealism. Sir CP shares his birthday with Shri Mataji, but never steps up to the occasion. Downplaying it's significance to let the true force shine through. Often silently but surely he affirms the benevolence and good luck, which has come his way since his auspicious marriage.